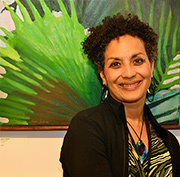 Julia Santos Solomon is one of the most successful contemporary Dominican artists today. She attended the Rhode Island School, Brown University. Her work is featured in museum and private collections throughout the world. The bright colors of the Caribbean landscape are an important vehicle for her expression. She portrays the mystery and beauty of vegetation. Her work was recently featured in the art publication "Acrylic Revolution" (North Light Books, 2007).